This week has been all about new beginnings for Bear and I. As mentioned in last week’s photo challenge, I moved my beautiful boy to a new barn on Tuesday. I picked December 31 on purpose. It was symbolic of leaving the past behind and starting the new year, and a new life, on completely fresh footing. Of course, making such a dramatic change creates challenges. Establishing new friends, new routines, new patterns of behaviour, and getting used to new surroundings takes time and energy and mindfulness. Bear and I are beginning a new chapter in our relationship. I am beginning a new chapter in my development as a horse person. Bear is beginning a new chapter in his development as a confident dressage horse. Naturally, such a major shift is unsettling for both of us. But it is a new journey we share mindful step by mindful step and a new opportunity to deepen my experience of living in the moment. With my horse. And with life. 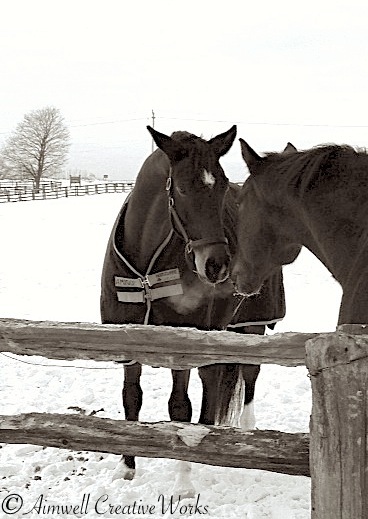 This entry was posted in Animals, Daily Post, Equestrian, Inspiration, Life, Personal Growth, Photography, Shout Outs, Uncategorized, Weekly Photo Challenge, Writing and tagged Aimwell CreativeWorks, beginning, black and white, Dorothy Chiotti, Equestrian, Equine image, Horses, inspiration, journey, Light and shadow, new year, Ontario, Photography, postaday, Weekly Photo Challenge, winter. Bookmark the permalink. Lovely photo and horses, Dorothy. I’ve never done dressage but have seen and admired it. All the best to you and Bear in 2014.